In the third and final episode of Singletrack Switzerland, a new Teton Gravity Research mountain bike project produced in partnership with Swiss International Air Lines, Switzerland Tourism, and BMC Switzerland, two American mountain bikers – pro rider Brice Shirbach, and pro skier Carston Oliver – join up with Enduro World Series destroyer Francois Baily-Maître to venture to the Jungfrau Region Switzerland, where they explore the little-known but incredible trails in a region rich with mountaineering and outdoor sport history with the help of Epic Europe. 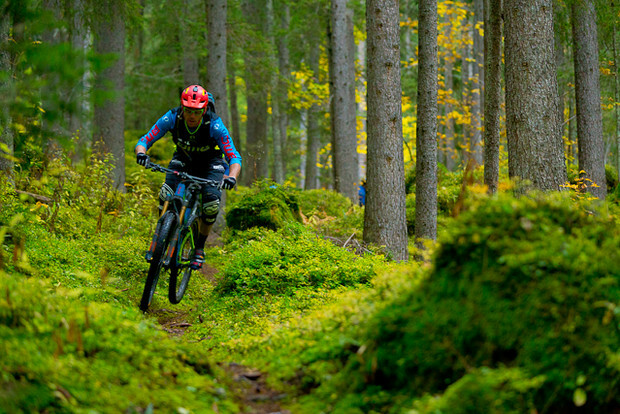 Francois Baily-Maître, fresh off a top-ten finish in the Enduro World Series, rallies through the forest above Grindelwald. Grant Gunderson photo. When the clouds peeled away from the roof of the valley that circles Grindelwald, the crew almost had to lay down on the grass outside the Hotel Kirchbühl to see the peaks of the Mönch, the Jungfrau, and the Eiger, whose north faces stack nearly 10,000 vertical feet of rock so close to town you could feel the cold from their icy faces on your skin. The sheer geologic contrast here stunned 18th-century visitors and soon led to Grindelwald’s status as a booming tourist town. Not long after, daring alpinists with homemade equipment began trying to tackle these peaks, with the most harrowing feats going down on the north face of the Eiger – the Nordwand – which is the biggest north face in all of the Alps, and a vertical cathedral framed by two insurmountable ridges. Over these peaks sits the Lauterbrunnen Valley, a deep, dead-end valley barely a kilometer across but with vertical limestone walls reaching as high as 2,600 feet above the valley floor. The valley has become so popular with visiting BASE jumpers that farmers have laid out landing targets in their pastures and charged for landings. Francois rallies down an open ridgeline in the Jungfrau region. Grant Gunderson photo. 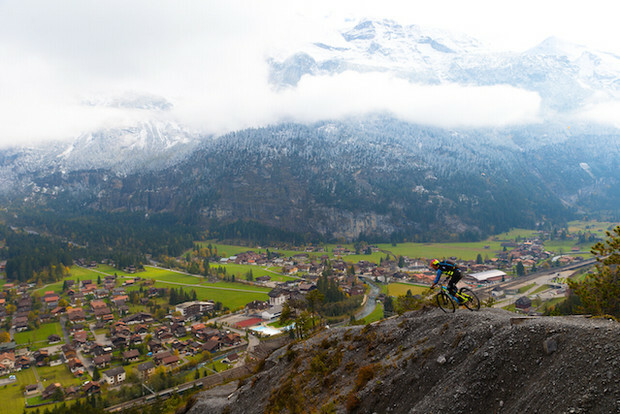 While mountain biking is a relative newcomer to the Jungfrau Region, and has a more humble history compared with the various feats of mountain daring that have colored the region’s past, the potential is truly incredible here. The lift and train-assisted trails these guys rode dropped from high alpine lakes with unmitigated views of the area’s biggest peaks, steadily descending until they swooped through lush forests brimming with dayglo moss and rooty technical sections. In the Lauterbrunnen Valley, after a gorgeous old rail car shuttled them to Mürren, they rode looping, flowing singletracks loaded with airtime, rippable corners, rock gardens, and root gaps as they hugged the slivers of flat ground between vertical limestone precipices, rolling past waterfalls poised to drop thousands of feet to the valley floor below. Getting a chance to ride trails so good – among the best of our trip – before they’re as well known as they should be was a privilege in an of itself.